Romance, adventure, and tradition. That’s how the guest ranch (aka dude ranch) got its start—as an entry into the West we dream about, and the way of the cowboy. 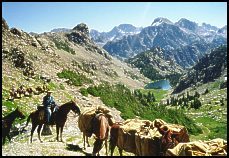 As Tim Singewald, at Wyoming’s DC Bar Guest Ranch and Bridger Wilderness Outfitters reminded us, yesterday’s kids saw Roy Rogers, John Wayne, and even Spin and Marty (Disney’s cool ’50s teen cowboys) on television daily—every little boy in America wanted to be a cowboy. Yet that image of the cowboy is missing from TV today and some of today’s kids don’t quite ‘get’ what’s so thrilling about being on a ranch and playing cowboy for a week. Or just playing in the great—really wild—outdoors. “Many city kids don’t really know what a dude ranch is—and how much fun it is,” Tim says. “They think of a ranch vacation as rocking on a porch and looking out at the sunset” and they think: BORING. Or they think a guest ranch is only for an accomplished rider. So not true. “They don’t realize there’s so much action and adventure here, and so much to try: Learn to fly fish, learn to ride a horse, learn how to camp outdoors, learn to watch (or track) animals,” Tim notes. And at some ranches, the list goes on to include learning to rope a calf, raft a river, shoot a bow and arrow, pilot a canoe, mountain bike ride, take photographs, try new yoga postures, and maybe even learn to be a little stronger, healthier, and more fit. And the old view of a ranch is, well, so five minutes ago. Now you can find a ranch with a candlelight dining rooms, even golf courses and spas and fitness centers where the ‘rents (parents, in kid lingo) can learn a few handy things, too, like tips on handling stress back in the real world. At places like Lost Creek Ranch, classes on yoga, hiking, and cooking are a part of packages offered regularly. At California’s Highland Ranch, you can learn clay pigeon shooting, take a yoga class, or brush up on your musical skills (the parlor piano is always in tune). Many ranches have Internet hookups for guest use, so you’re never that far out of touch. But the timeless thrill and romance? Well, it’s still here, in the horses galloping through the pastures (with you in the saddle), the froth of whitewater on an untamed river (with you paddling the raft), and the tangerine glow of a campfire (reflected in your kids’ shining faces). And the adventures a child and the kid in all of us adults can have in the open air. Good times. Right now, we’re all feeling the pull of nostalgia, the remembrance of easier, better, more honest times. What easier way to recapture, no, to LIVE those good times than to go off and play cowboy for a while? Take the plunge. 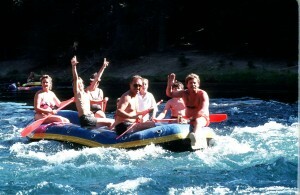 Jump on that horse (or into that river raft). Make a new tradition for your own family, by following the traditions of America’s guest ranches and the romance of the cowboy way. Along the way, you’ll find romance, action, and adventure you never dreamed possible in this age of cold computers and blaring iPods. Thanks for the reminder, Tim. Editor’s note: This is the third in a series, 5 reasons Americans need a dude ranch vacation NOW, a part of the ongoing “Discover Ranch Vacations Campaign”. 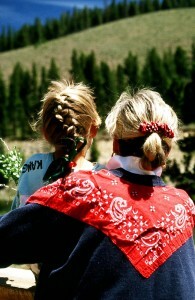 Family reunion groups are discovering that a dude ranch is the perfect host for their unique gatherings. Consider the advantages: a dude ranch is by its nature warmly welcoming and family-friendly, so you’ve set the right tone immediately. Everything is taken care of, so no need to worry about catering and setting up activities. And you’ve got a getaway with a single price (no annoying add-ons), so every member of the group can plan ahead. Set near Jackson Hole, Wyoming, the ranch offers great rates in low season (May 31 – June 14 and August 30 – September 6). A guest ranch is an ideal solution for such gatherings, with both indoor and outdoor options for your family meetings, whether it be in the great room in the ranch house or a conference room in the bunk-house. Look for a ranch that can accommodate groups. 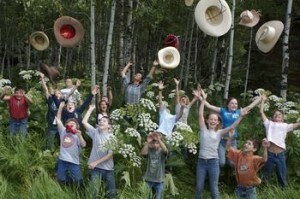 More ranches to consider for family reunions: Angel Ridge Ranch, near Ridgeway and Ouray, in Colorado. And check the Lodge at Sun Ranch (formerly Papoose Creek) in Cameron, Montana. The West’s historic dude ranches are unique. They tap into years of tradition and often, storied tales of pioneering the West. Recently, we talked about some of Montana’s historic ranches . As a result of our story, Kelly Kelsy, from Nine Quarter Circle Ranch in Montana, wrote to tell us more about her historic ranch. 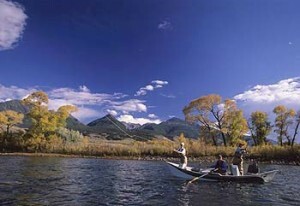 Set in Gallatin Gateway, the Nine Quarter Circle Ranch sits in the high country of the Montana Rockies. At 7,000 feet in elevation, surrounded by national forests containing a million acres of primitive wilderness, the ranch offers a variety of riding and unspoiled trout waters. The ranch history dates back to the 1800’s, when it was first homesteaded; Indians once ran elk herds here, Jim Bridger rode after buffalo, and Chief Joseph passed near here on his retreat to Canada. What else the guests love: spending time with their family; “having real quality time, not superficial time”. And the time to make those memories that last a lifetime. “We are seeing fourth-generation families coming back year after year,” she adds. “Many of the families that met here are now friends in their personal lives and have become involved with all the joys and sadness that comes with those friendships.” Those relationships are the kind that take time to build. And it helps to know the ranch will be there, when you’re ready to reconnect, just as it has been for decades. More historic ranches: In Wickenburg, Arizona, the Kay El Bar Ranch has been operating since 1926, and is on the National Register of Historic Places. And in California, the Hunewill Circle H Ranch has attracted guests since the 1930s and ranching since the 1860s. Now that’s historic! Well, that generated a nice note from Mary Bahus-Meyer at Colorado‘s Sylvan Dale Guest Ranch about their wedding packages. Mary told us about Sylvan Dale Guest Ranch’s romantic location—in a scenic spot in the Colorado Rocky Mountain foothills, just 7 miles west of Loveland, and an easy hour drive from Denver (DIA). And if you’re looking for a memorable Rocky Mountain site for your wedding, consider Sylvan Dale. It’s aptly named, with wide open spaces, tranquil ponds and lakes, and the Big Thompson River flowing through the 3,200-acre property. They’re open year-round for weddings, and the most popular dates are (‘natch) May through mid-October because “brides like to be married outdoors in our scenic setting”. They can accommodate 50-180 guests. Mary tells us that ceremonies can be held in the Jessup Lodge (indoor or outdoor options); a two-story building with a dining room on the lower level, fireplaces, antique furniture and western charm. Reception facilities on the upper level overlook the twisting Big Thompson River. Another option: The Heritage reception room is a warm and charming spot, with dramatic stone fireplace, log trusses, oak flooring, a covered wood porch, and an adjoining game room. Outside, the Daddy J Pavilion is a third choice; a 30′ by 60′ covered pavilion tucked into the bend of the Big Thompson River, for a casual, intimate gathering or a grand affair. 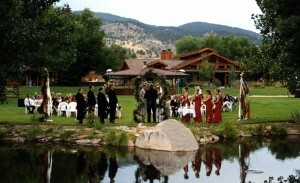 The adjacent ceremony site is beautifully landscaped with an expansive lawn, and edged by wildflowers and aspen trees. Generally, all packages include: one-hour rehearsal, ceremony and reception sites, ceremony chairs, tables for guestbook, programs, unity candle, music, gifts, cake, bridal party, guests, buffet, and bar, white linens, tableware, glassware, napkins, dinner menu, non-alcoholic beverages, fresh fruit, cheese, and crackers, champagne and sparkling cider toast, cake-cutting services, wait staff and bartenders. 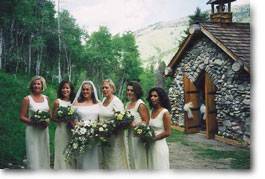 Contact: Sue Bennett – wedding coordinator – 970/667-3915 x. 11. E-mail: sueb@sylvandale.com. And please, tell ‘em the Ranchweb blog sent you! Simplify, simplify, said Thoreau, and it’s not bad advice, especially when planning a wedding. And for prospective brides (and their mums), planning a wedding doesn’t get much simpler than choosing to hold it at a dude ranch. I know, it’s thinking waay outside the box. But consider: by choosing a ranch, you instantly simplify your life. No need to book a separate chapel, hire a caterer, or find a baker for that pesky cake. They can cover all of that for you, and lodge your out-of-town guests to boot! Take the Diamond D Ranch, outside Stanley, Idaho. Weddings have become increasingly popular here since a chapel (at left) opened its doors here in 1997. 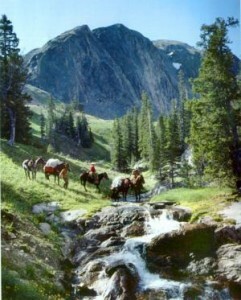 “It is a truly unique experience to be married in God’s country, deep in the Frank Church Wilderness,” says rancher Linda Demorest. It took 11 summers to complete the intimate and unique chapel, which they built rock by rock. Demorest is also a minister and performs many weddings inside the structure, which overlooks Loon Creek. Others have chosen to be married out near the lake, in the gazebo, or even the spacious front lawn. Diamond D Ranch wedding packages include a minister, accommodations (yes, there’s a honeymoon suite), use of all facilities, all activities- including horseback riding-and a fully catered gourmet menu (typically, a variety of appetizers, dinner, and next day’s brunch). Of course, set up and take down of all wedding decor, flowers, tables, and such is included. A wedding cake can be provided, and beer and wine can be served (an additional cost). Beautiful, unique, and above all simple. What more could any bride want for her wedding? More ranches with wedding packages: Try Colorado’s Sylvan Dale Ranch, just one hour’s drive from Denver or Rocky Mountain National Park; we’ll write more about Sylvan Dale’s wedding packages next week. And if you’re looking for a southwest setting for the nuptuals, check out Tanque Verde Guest Ranch outside Tucson.